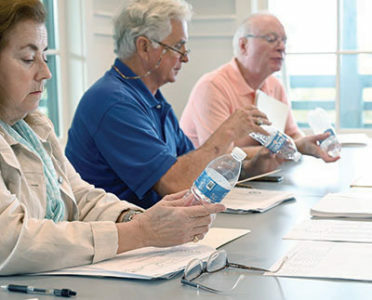 Council members check the classification of their plastic water bottles during discussion of the recycling program. Items collected on Pawleys Island from a recycling program the town started nine years ago are going straight to the county landfill because they aren’t being collected properly. “All of our recycling is not being recycled. It’s being contaminated,” Administrator Ryan Fabbri told Town Council this week. The council deferred discussion about changing the collection program. The town started a voluntary recycling program in June 2010 after getting requests from second-home owners and visitors. It arranged with Rutledge Disposal, which handled 90 percent of collections on the island, to pick up plastics and metals from carts that the town provided to property owners. The town also provided clear plastic bags that were required for the recycled items. The town’s goal was to reduce its waste stream by a third. It pressed Georgetown County to expand the list of recyclables to include paper. The problem now is that the county can’t sort the material that comes in from the town, Fabbri said. He toured the landfill last week with Michelle LaRocco, the county environmental services manager, who showed him the result of the town’s collections. “There’s stuff that’s not even recyclable in there,” Fabbri said. The county wants the town to drop paper from its collection and stop requiring plastic bags. The tight market for recyclables is one reason for the change, Mayor Jimmy Braswell said. The company that buys the material from the county wants it “pure and clean,” he said. The county will accept plastics and metal. They can be collected in the same bin. At the landfill, they are sorted by hand. Fabbri estimated the change would cut the recycling stream by 60 percent, but he said it would actually be recycled. Paper could be collected separately, perhaps once a month, he said. The town could require people to take it to the county recycling center, which they must do with bottles anyway.